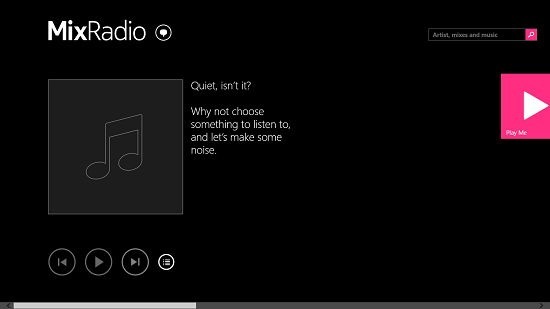 MixRadio is a free music app for Windows 8 and 8.1 in which you can listen to music from online sources. When you run the app on your device, you will be presented with the app’s main screen where you can set your favorite artist and then can also choose to play back all or any tracks related to them. You can choose to skip this step if you wish via the Skip button in the app’s main interface and you will be straight away taken to the app’s main screen where it will present you with a suggestion of mixes that you can listen to if you have skipped setting the favorite artist in the first page of the app. You can also click on the search bar at the top right of the screen which enables you to type an artist or a track that you are looking for and once you have typed in the desired keyword for which you are searching, you can press the Enter button and you’ll be presented with search results. You can then choose to click on any of the results to start the playback. MixRadio is available for free from the Windows App Store. When you install and run the app on your device, you will be presented with an interface which looks like the screenshot shown below. Here, you can choose to set your favorite artist or skip this step altogether. Once you have set your favorite artist or skipped the step via the Skip button at the bottom left of the screen, you’ll be presented with the app’s playback interface which is the actual interface of the app allowing you to play the tracks which you desire. Simply scroll to the right and select from the premixes designed for you. Clicking on any one of them will begin the playback. You can see the track being played back in the screenshot above. 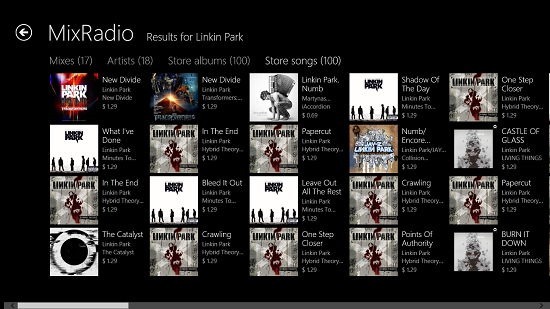 Alternatively, you can also choose to play a track by searching for it via the search bar at the top right. Your search results will be presented to you in the following way. The results are sorted according to artists, songs etc. You can access any of these tabs by merely clicking on the title of the categories. To play back a track, simply click on its tile. 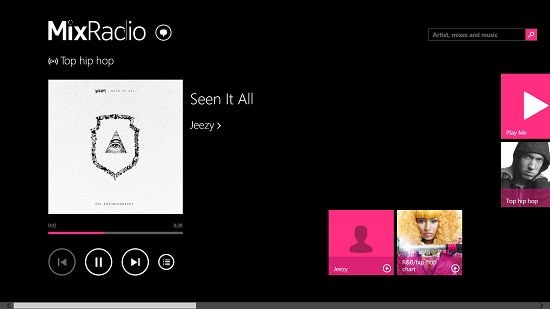 This concludes the main features of MixRadio for Windows 8 and 8.1. MixRadio is a ruggedly well designed app for Windows 8 and 8.1 devices which makes for a great download on your device if you are a fan of different genres of music. You can grab it from the link below.